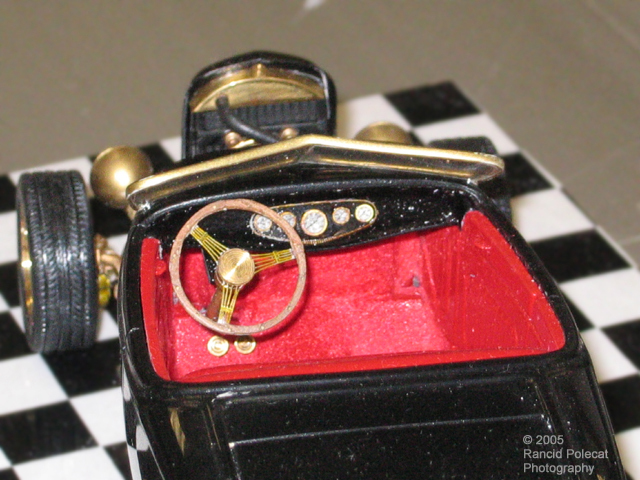 The interior tub is another Replicas and Miniatures Company of Maryland piece that is matched to their roadster body. The dash board is also a R&M Co. resin part and sports a set of R&M Co. gauge faces surrounded by an R&M Co. photoetched face plate. The steering wheel is an R&M Co. piece featuring a cherry wood rim and photoetched spokes, which is perched atop one of Chad's home-machined steering columns and topped with a home-machined horn button. Just below the steering wheel and column, you can see Chad's own machine fuel and brake pedals.